Marina Ferretti has confirmed the authenticity of this work. Paul Victor Jules Signac was one of the foremost French neo-impressionist painters of his time. Born in Paris on November 11, 1863, he intended to study architecture but decided on painting after meeting Claude Monet. Though he was initially influenced by Monet, his early works also show the influence of Alfred Sisley and Armand Guillaumin. In 1884 Signac became a founding member of the Salon des Independants, where he met Georges Seurat. The two men greatly influenced each other's oeuvres and are credited with the development of the Pointillism style of painting, which became the basis of Neo-Impressionism. Signac was President of the Society from 1908 until his death in 1935, and Signac encouraged younger artists (he was the first to buy a Matisse painting) by exhibiting the controversial works of the Fauves and Cubists. He and the neo-impressionists are credited with influencing the next generation of painters including Henri Matisse and Andre Derain, therefore contributing to the creation of Fauvism. This watercolor depicts the seaport town of Cherbourg in northwestern France. 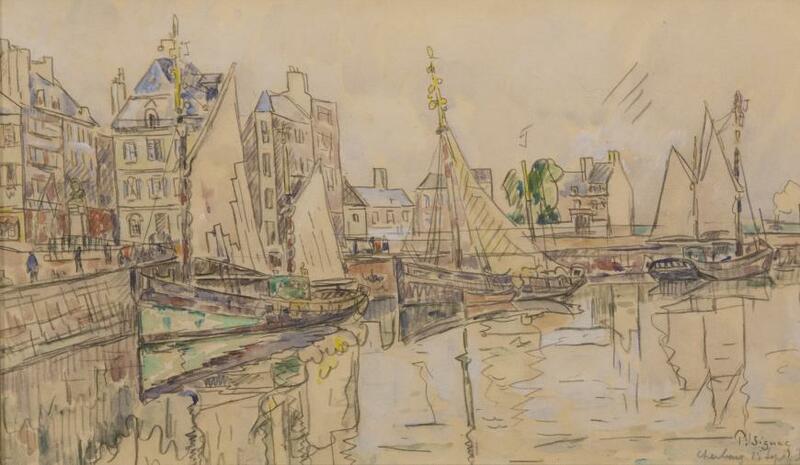 A beautiful example of Signac’s late work, it features sailboats, one of his favorite subjects. 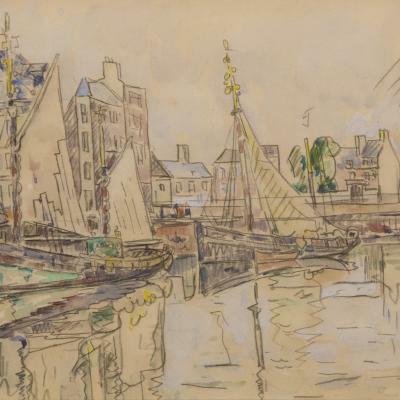 Multi-level buildings in the background hint at the bustling port city, but the soft palette and gentle lines render the painting a feeling of calm quietude. The soft blue sky peeks out under fluffy clouds, and the sailboats reflections highlight the water rippling from the wind. Signac loved the subject matter of the outdoors and especially the French Coast, and each summer left Paris to reside in the South of France in the village of Colliour or at St. Tropez. He developed a love for sailing, which would lead him to ports throughout France to Holland and the Mediterranean, basing his boat in St Tropez. While traveling he would sketch watercolors from various sites and return home to paint large canvases that carefully displayed small mosaic-like squares of color. He worked in various media such as oil paintings, watercolors, etchings, lithographs and many pen-and-ink sketches composed of small dots. From his various travels, Signac brought back vibrant, colorful watercolors, sketched rapidly from nature. 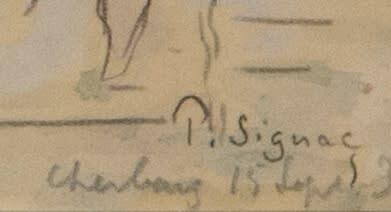 From these sketches, he painted large studio canvases that are carefully worked out in small, mosaic-like squares of color, a technique quite different from the tiny, variegated dots previously used by Seurat. 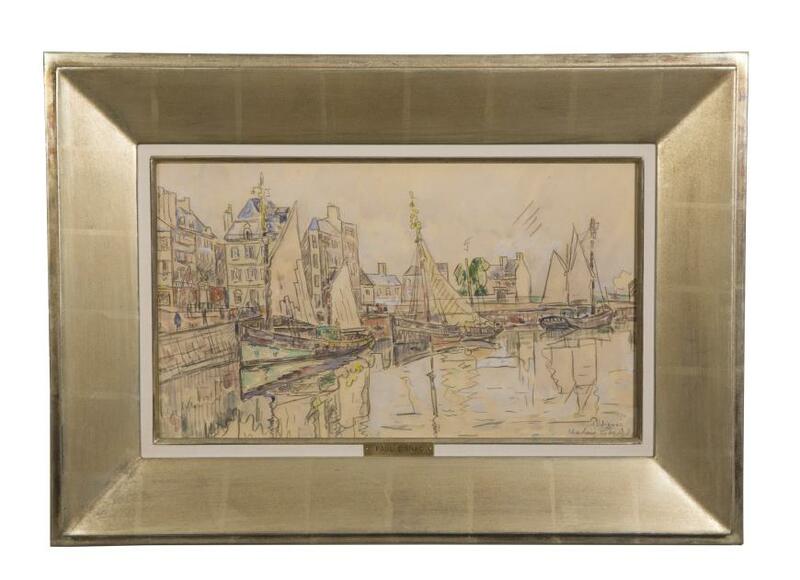 Please notify me when works by Paul Signac become available.